This page describes various ways to visualize COSMO (Consortium for Small-scale Modeling) data. 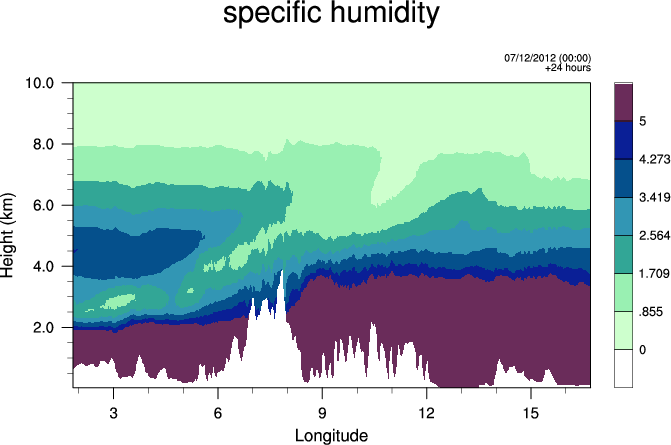 The COSMO is a non-hydrostatic limited-area atmospheric prediction model operated and developed by a international consortium of weather services. Oliver Führer from MeteoSwiss provided all the materials for this page. The "gt" files are available as a tar file. All scripts below are provided in two versions. The plain version "cosmo_n.ncl" will work with your plain NCL installation. The "cosmolib_n.ncl" scripts mentioned below are based on a library of additional NCL scripts called "COSMOlib", which hide some of the complexity of handling both GRIB and NetCDF. MeteoSwiss uses a suite of color tables that they've developed and contributed to the NCL project. cosmo_1.ncl (cosmolib_1.ncl) This script creates a simple 2D contour plot with the correct geo-referencing of the field in rotated-latlon-coordinates. In principle, this script can then be used to overlay the data onto any other map projection. cosmo_2.ncl (cosmolib_2.ncl) This script shows how to plot a vertical cross-section, considering the correct terrain-following grid positions of COSMO.